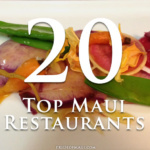 Welcome to our list of the Top 30 Places for Local Food on Maui! 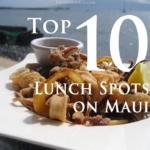 Whether you are a local and already have your favorite local food spots in Hawaii, or a visitor that’s craving their first plate lunch ever, you will definitely enjoy reading about the best places to go for local food on Maui. Local food in Hawaii has a long and rich history. The diverse history of this Hawaiian culinary passion comes from all people that came to the islands to live, work, play, and lay their roots down. “Local food,” typically refers to a combination of fare from a variety of cultures that migrated to the Hawaiian Islands. This includes people of various Polynesian, American, Chinese, Filipino, Japanese, Korean, Spanish, and Portuguese origins. Taro, the root that Poi is made from is an indigenous Polynesian root plant, and so is the delicious Pohole Fern. Baking Banana was introduced by the Tahitians, and Breadfruit was brought by the Marquesans. Korean immigrants introduced Kim Chee and Barbecued Meats, and Sashimi and Bento came from the Japanese. Rice was introduced by the Chinese, and Mac Salad was later introduced by the Americans. As more settlers came to Hawaii for various purposes, the Portuguese brought Sweet Bread and Malasadas, the Spanish added Pasteles and Spices, and the Filipinos introduced Adobo-style garlic dishes, peas, and beans. So, with all this food culture history, it’s easy to see how Hawaiian-style local fare has been created, and how it has evolved. Local Hawaiian food is always enjoyed to the fullest! If you ever hear a local say, “Shoots cuz, this is da grindz..”or,“Aunty’s Saimin broke da mouth!” or, “That is da ono kine chopped steak!” Stay where you are, get in line, and put your plate lunch order in! The flavors and recipes of Hawaiian local food really do invoke the history of each culture they originated from. Local food in Hawaii tells a story about how all people who’ve settled in Hawaii have made their contribution to the local food genre as it is today. When eating local food on Maui, do not forget to geevum a shaka and say Mahalo to Aunty! If you are looking for a local deli-style restaurant with delicious organic food, this is the place for you. 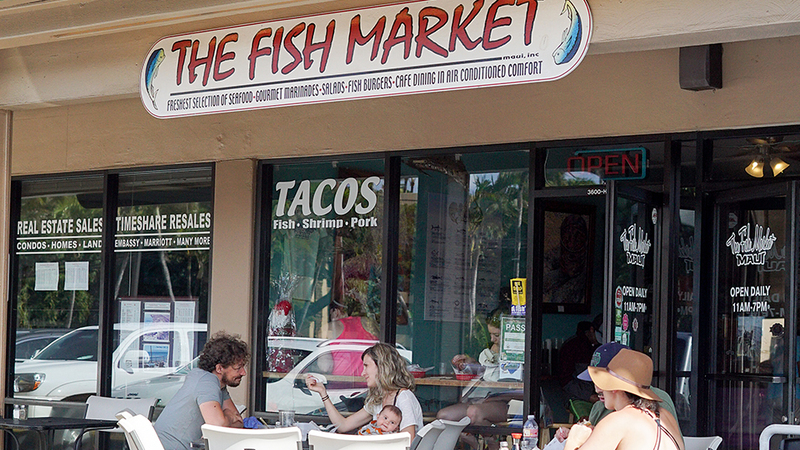 We love this small tucked away deli across from The Cove in Kihei. This is the perfect spot to grab lunch to go and head to the beach. Joy’s place is very casual, with counter service and pick up. There are a few tables if you do want to stay in to eat. Service is friendly and helpful here. They serve up delicious salads, homemade soups, fresh fruit smoothies, acai bowls and locally made kombucha on tap. They also have a nice selection of vegan, vegetarian and raw options. We shared the grilled cheese deluxe which came with an amazing homemade pesto sauce, tomato, avocado, crispy lettuce on a yummy homemade sprouted grain bread. We also love the vegan chili with brown rice. It was tasty with just the right amount of zesty spices. The “Maui Fruit” smoothie is so fresh and filled with tropical flavors that include pineapple, banana, and lilikoi (passionfruit). Add the fresh ginger for an amazing twist that ads a little spice to the taste. Joy’s place is proud to offer a wide range of healthy food choices for everyone. Also open for breakfast, the organic cold brewed coffee pairs perfectly with the panini egg sandwich or the vegan breakfast burrito. Open Monday-Friday 7:30 am-4:00 pm and Saturday until 2 pm, closed on Sunday. For more information, please visit Joy’s Place. Next time you’re on vacation on Maui, do not miss out on a chance to eat some of the best local food on Maui at Sam Sato’s. Located in Wailuku, this little, hidden gem has been owned and operated by the Sato family since 1933. Now run by the 3rd generation, this place is known best by locals, and less frequented by visitors. If you can find Sam Sato’s in Wailuku, make sure you arrive on the earlier side because they are only open for breakfast and lunch. The breakfast menu consists of your usual eggs and breakfast meats, hash browns, omelets, and local favorites. 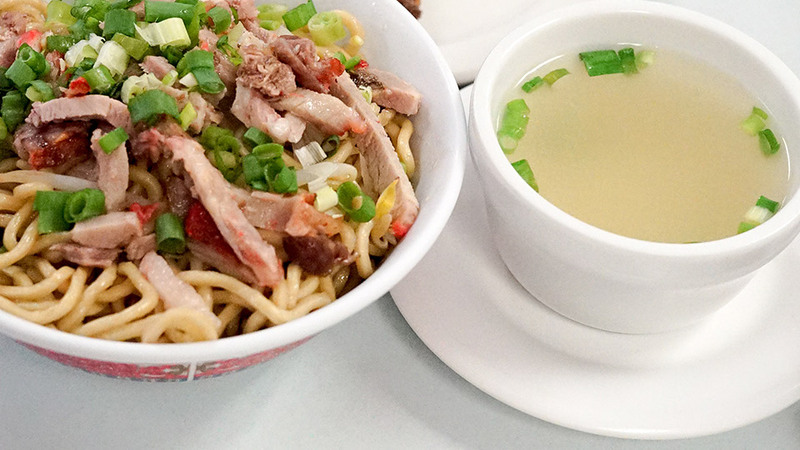 Lunchtime is popular with super ono plate lunches (chicken, beef, or pork with rice and mac salad), a variety of noodle and saimin bowls, sandwiches and burgers. Definitely, try the Dry Mein at Sam Sato’s, it’s one of the most popular items on their menu. In case you don’t already know, Dry Mein is like Chow Mein…dry noodles, char siu pork, bean sprouts, green onions, dash and shoyu, completed with Sam Sato’s famous seasoning. Must order items at Sam Sato’s are the Dry Mein, Chow Fun, Teriyaki Beef Sticks, Plate Lunches, Kim Chee and the Sweet Lima Manju for dessert. For more information, please visit Sam Sato’s Restaurant online. T. Komoda Store & Bakery Inc. Since 1916, the Komoda Store & Bakery has always been hands down the best donut store on Maui. 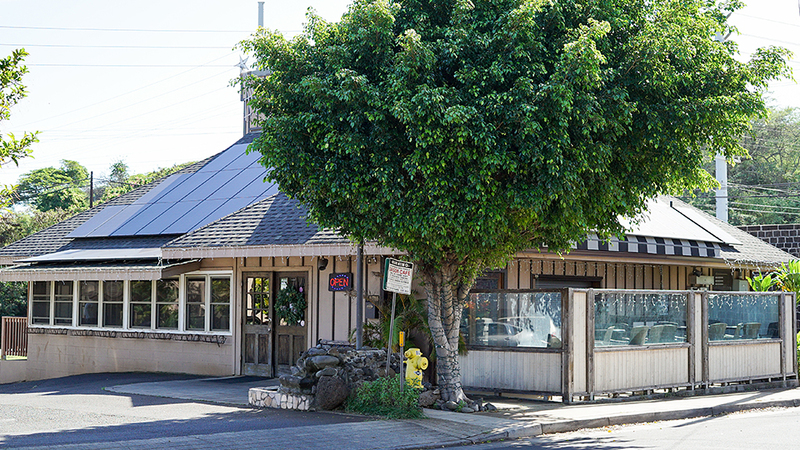 Here in the Historic Makawao Town, residents and visitors will always enjoy delicious and timeless Hawaiian-style baked goods. If you’re heading Upcountry to the Haleakala Crater or to the Ali’i Kula Lavender Farm, do not miss out on this rare Maui local foodie opportunity! Arrive early, doors close when the bakery sells out. All-time favorites, and must order items at the Komoda Bakery are the Glazed Stick Donuts, Strawberry Doughnuts, the Chocolate & Vanilla Cream Doughnut, Cream Puffs, and the Guava Malasadas. For more information, please visit T. Komoda Store & Bakery online. 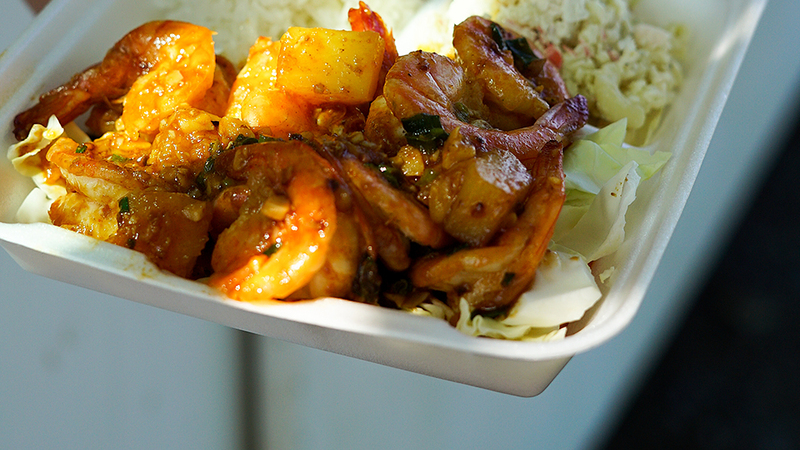 Voted Best Food Truck on Maui for 2 years in a row, Geste Shrimp Truck is for sure the best shrimp truck at Kahului Harbor. Both residents and visitors love Geste, most popular for their Any Flavor Shrimp Plates: Hawaiian Scampi, Hot & Spicy, Spicy Pineapple, or Lemon Pepper. Phone: 808-298-7109, phone orders are welcome! For more information, please visit Geste Shrimp Truck online. 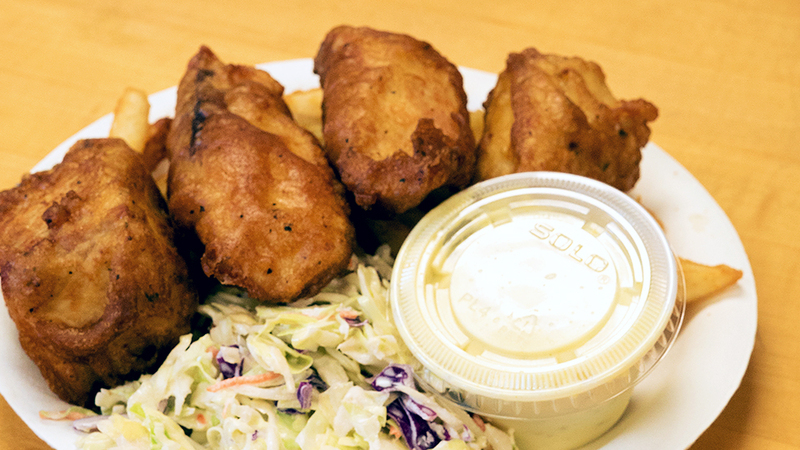 Located in Kihei Town, Eskimo Candy Seafood Market & Cafe is one of the best local seafood restaurants on Maui, and they also have delicious plate lunches. The owner, Jeff Hansen, came up with the Eskimo Candy concept after an Alaskan fishing trip he took in 1987. The business began as a wholesale seafood distributor, and since 2003 added to the restaurant. Favorite Maui seafood menu items are the Tempura and Coconut Shrimp, Homemade Crab Cakes, the Local Plate Lunch with Battered Fish, the Captains Platter served with scallops, coconut shrimp, oysters, fresh fish and calamari, and the Poke Bowl which comes with of ahi poke shoyu, spicy tuna, furikake, wasabi, shoyu, served over white rice, and topped with a yummy wasabi aioli. ***A little-known fact is that ‘Eskimo Candy’ is actually the word used to describe the belly strip of smoked salmon. 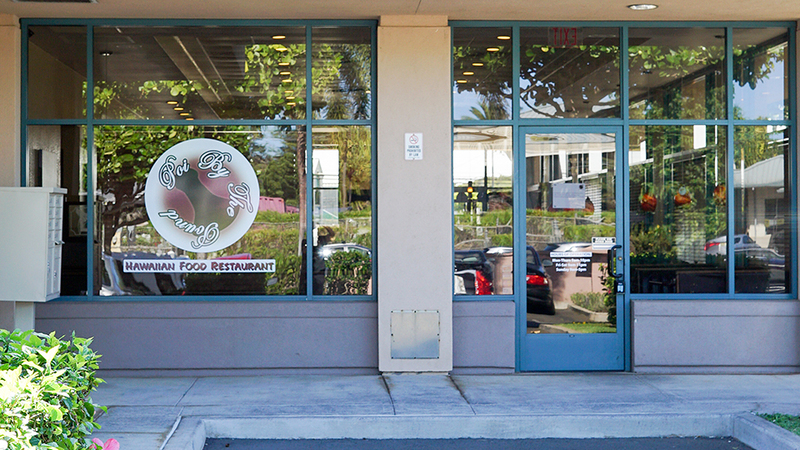 This Maui seafood market and cafe also have two more locations on Kauai and Oahu. For more information, please visit Eskimo Candy online. Since 1918, ‘Grandma’ has been roasting and blending organic Maui coffee in her Upcountry locale. 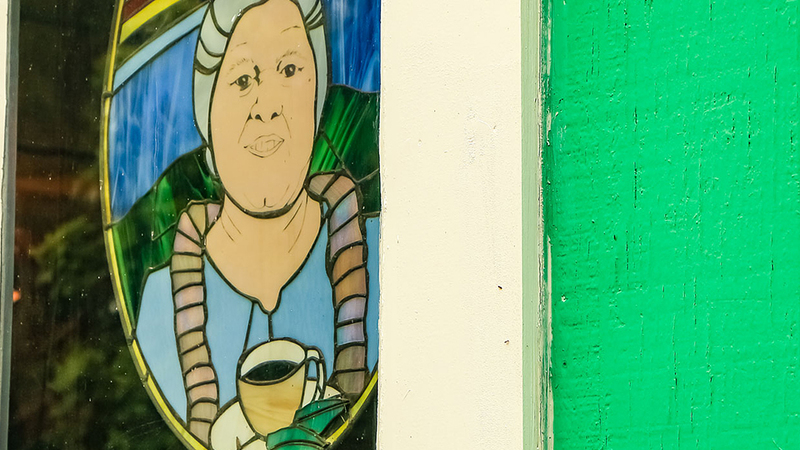 Set in Keokea, Grandma’s quickly became one of the only Up Country pit-stops for residents to grab a good ol’ cup-a-joe and talk story with friends in their community. Four generations later, Grandma’s is still holding strong, and family run. The family still grows and processes the same pesticide-free, organic Arabica coffee strains originally cultivated by their great-grandparents on Maui. 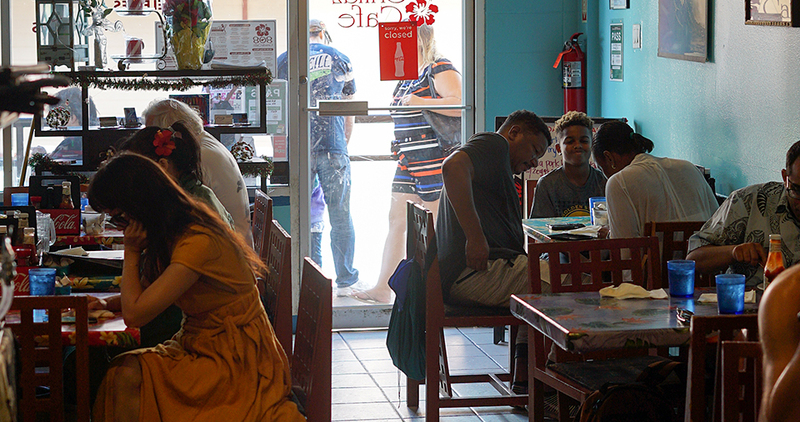 Whether you’re just hanging out in Keokea or driving to or from the back Road to Hana, definitely try to make a stop at Grandma’s Coffee House. Fill your belly, enjoy some caffeine, and revel in the gorgeous upcountry view from their terrace. The coffee and the espresso drinks are good and strong, and the baked goods and desserts are sinfully delicious. Lunch is always a good choice at Grandma’s Maui Coffee Shop with daily specials like spinach lasagna, paniolo pork chops, meatloaf, fresh fish plates, and more. They also have a perfect selection of sandwiches, soups and salads. For more information, please visit Grandma’s Maui Coffee House online. A Saigon Cafe in Wailuku is a consistent winner of the annual Maui Aipono Restaurant Award, and one of Maui’s best-disguised foodie gems. On the outside, it looks something like a late 1970’s Hawaiian-style roadhouse, and on the inside, it is like a flavor dynasty of local-style, authentic Vietnamese dishes. 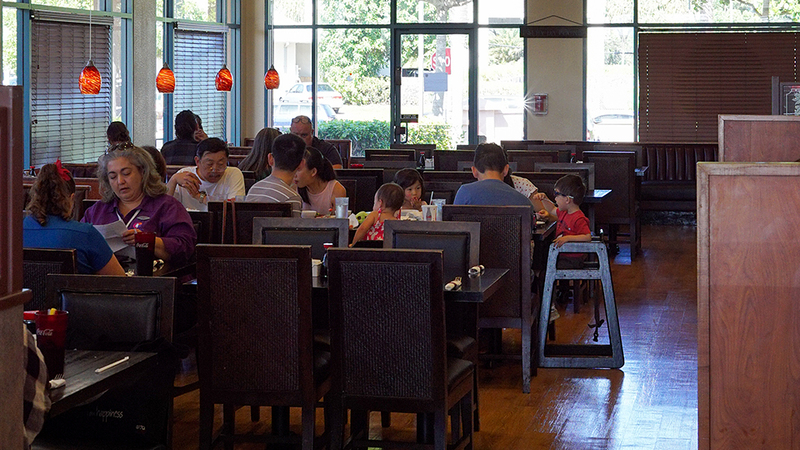 At Saigon Cafe, you can expect friendly service with a touch of aloha and an overabundance of flavor-filled dishes. There are so many wonderful options including a variety of pho and soups, rice and noodle dishes, clay pots, cold salads, fresh seafood, and meat dishes. Favorite items at Saigon Cafe in Wailuku are the Garden Delight Rolls, Green Papaya Salad with Shrimp, Whole Steamed Opakapaka, Chicken Curry Stew, Mahi Mahi in a Clay Pot, Saigon Egg Noodle Soup, and the Vietnamese Steak. No matter what you choose at this Central Maui restaurant, you will most definitely be pleased. For more information, please visit A Saigon Cafe online. “We’re becoming a food destination,” says Will Munder Executive Chef of Ulupaluakua Ranch Store & Grill. “Before,” it was ‘there’s the winery,’ or ‘ it’s a nice drive,’ but now people are coming here from the West Side just to have lunch. The Ulupaluakua Ranch has deep roots in Maui’s agricultural history, operated by multiple families since 1856. Since 1963, Ulupaluakua Ranch (approx. 18,000 acres), including the historic ranch store, has been owned and operated by the Erdman family. We encourage you to take a drive upcountry to see breathtaking views of outer islands, Mt. Haleakala, and the rolling hills and pastures of Kula, Keokea, and Ulupalakua. Definitely plan on pulling over for lunch at the Ulupaluakua Ranch Store and Grill while on your way to the Ulupaluakua Maui Winery*** Mostly frequented by locals, this Upcountry ranch store has some extra special menu items, sparsely found throughout the Hawaiian Islands. Popular menu items are the famous Ulupaluakua Elk Burger, Maui Cattle Company Beef Burger, the Hot Roasted Kalua Pig served on a fresh torta roll, and Uncle Mike’s Steak Chili & Rice Bowl. The plate lunches are to die for, our favorite being the Hamburger Steak served with Kona Coffee Gravy and Roasted Garlic Aioli, with your choice of beef, elk or lamb. At the Ulupaluakua Ranch Store and Grill, guests can put their minds at ease knowing that all meats served are 100% all-natural island grazed, with no growth hormones or artificial ingredients. For more information, please visit Ulupaluakua Ranch Store and Grill online. For more information, please visit Tasty Crust online. Owned by Top Chef finalist, Chef Sheldon Simeon and his wife Janice, Tinfoof is a hot spot on Maui for delicious local grinds. You will find Tin Roof just off Dairy Road in Kahului. It’s a great place to stop right off the plane, or on your way to the airport before departure. 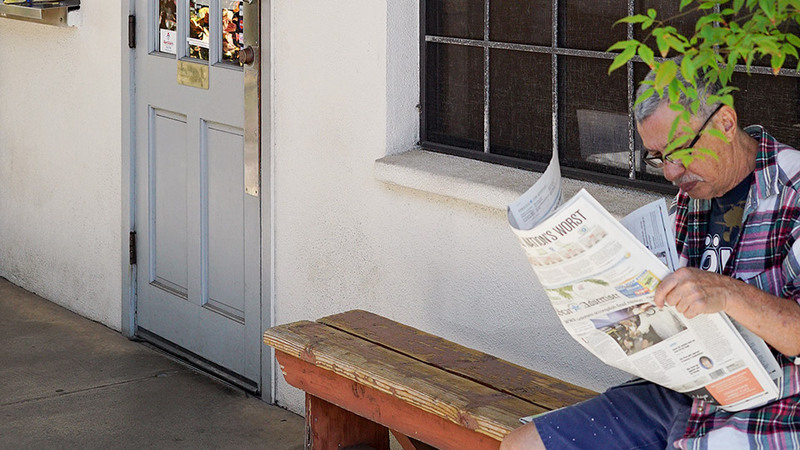 Be prepared for a wait at this super tiny, packed restaurant with very little seating. But keep in mind that the food is worth it! Inspired by his upbringing in Hilo on the Big Island, Sheldon has created and polished his recipes to perfection. It was Sheldon’s vision to offer families affordable comfort food made with aloha from quality, plus locally sourced ingredients. All dishes but the poke are just $10 or under. You must try the Mochiko Chicken Bowl! This is hands down the most delicious dish in the house. It’s made from chicken thighs that are marinated overnight in ginger sake shoyu, breaded with sweet mochiko batter, then deep fried not once, but twice. This makes this chicken crispy on the outside and extra juicy on the inside. 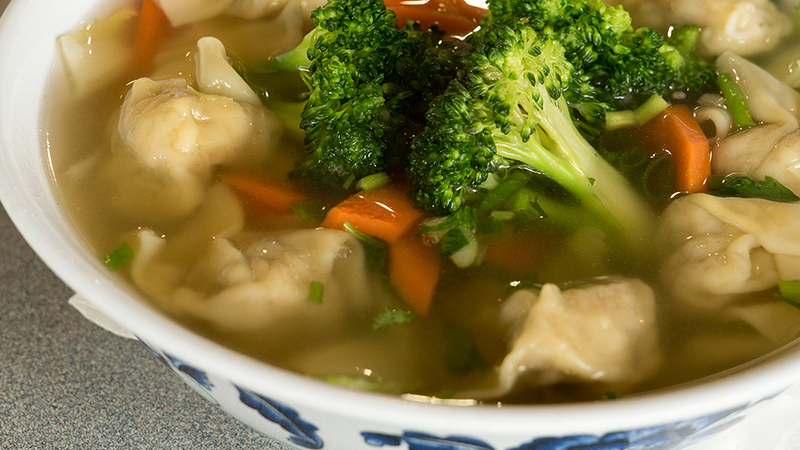 It is served with your choice of white or brown rice, kale or Chef Sheldon’s famous garlic noodles. For just a dollar more you can add a one minute egg that pushes this dish right over the top. All dishes except Poke include a side of salted cabbage. Other mouth-watering dishes to try here are the garlic shrimp, chopped steak, and the fresh poke bowl that varies daily. Most dishes are available with a gluten-free option when requested. It’s a good idea to get here early before the crowd hits for lunch around 11 am, not just to beat the long line, but because they tend to sell out and close for the rest of the day. Tin Roof is open Monday through Saturday 10:00 am-2:00 pm or until sold out. For more information, please visit Tin Roof. 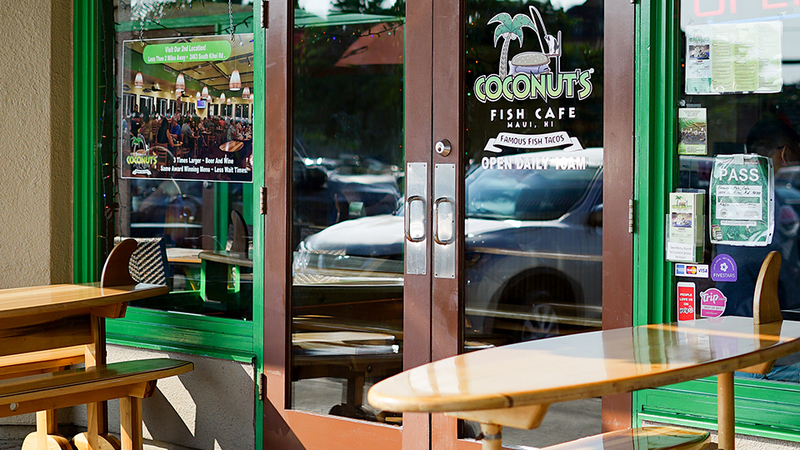 In 2013, Coconut’s Fish Cafe was a part of CNN and Travel & Leisure’s list of “Top 10 Places to Eat Like a Local.” The list wasn’t a top 10 list for Maui or even Hawaii. It was a top 10 list for the whole United States! Founded on Maui by owner Mike Philips, Coconut’s Fish Cafe in Kihei features a simple selection of tasty and reasonably priced seafood menu items. Hawaiian fish used throughout the menu include Opakapaka (Crimson Snapper), Ahi (Yellowfin Tuna), Mahi Mahi (Dolphin Fish), and Ono (Wahoo). 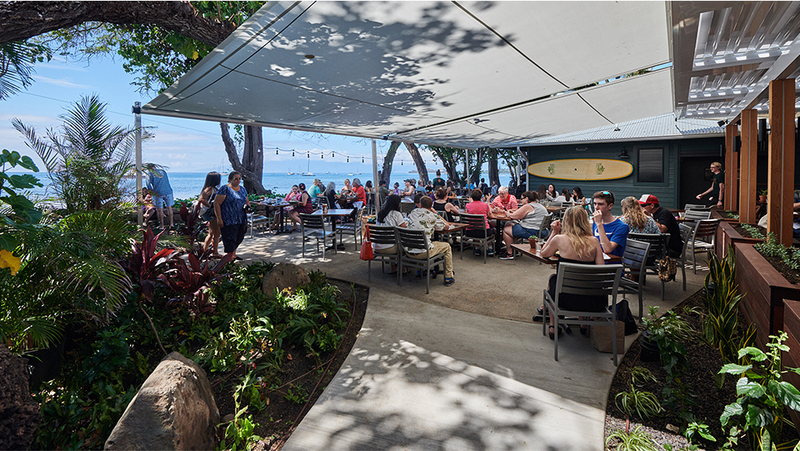 Not only is the food super good here, but guests will also love that this family-friendly Maui restaurant is fun, with a cool beachy interior and a friendly staff. 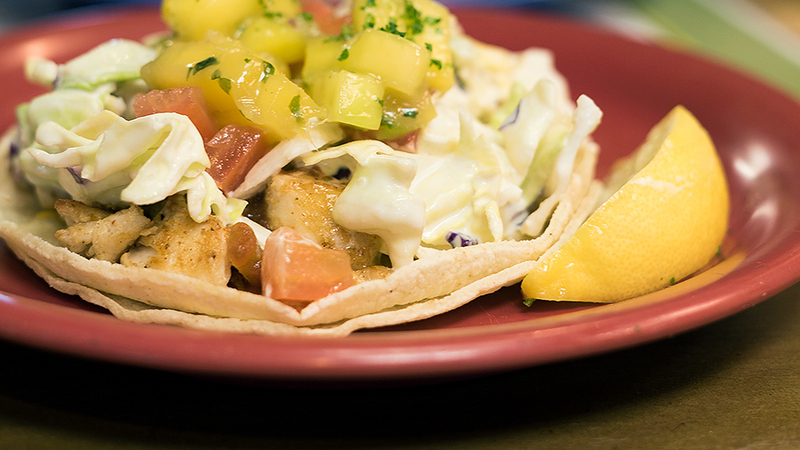 Favorite items on the Coconut’s Fish Cafe menu are any of their famous Fish Tacos including the Taco Mountain, Coconut Shrimp, any of the Fishburgers, the Seafood Caesar Salad, and the Local Style Fish served with brown rice. Boom! For more information, please visit Coconut’s Fish Cafe online. 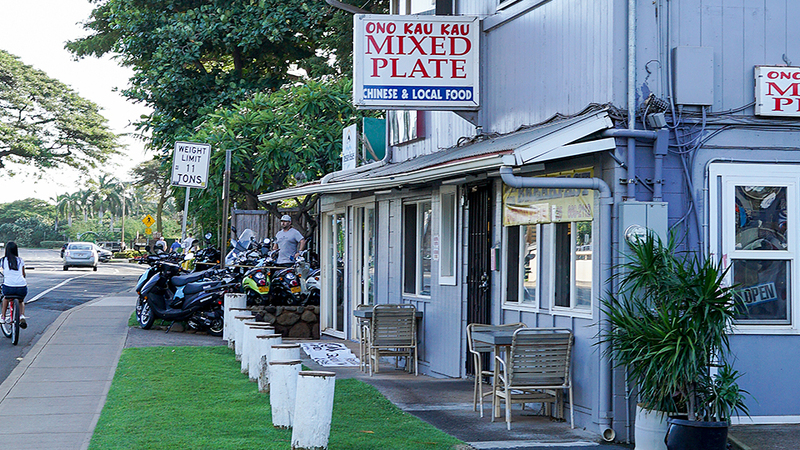 Ono Kau Kau Mixed Plate is another one of Maui’s very special local food and plate lunch spots. Located in Lahaina, this darling little gem is exactly how it should be. Ono local Hawaiian-Chinese style grinds, a modest looking restaurant with only 4 tables, affordable prices, NO MSG, and a friendly staff. If you like Spam Musubi, some people say that Ono Kau Kau has the best on the island. 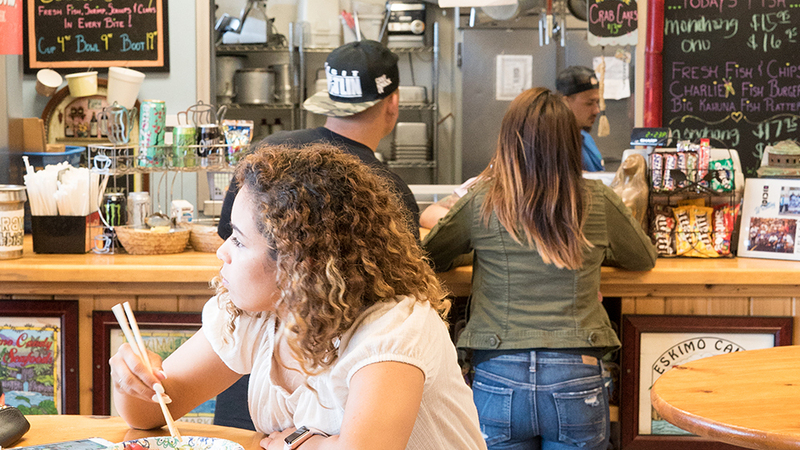 With options like the Mahi Mahi Omelette, Loco Moco, Garlic Ono Fish with Teriyaki Beef, Chicken Katsu Curry, Beef Noodle Soup, and Kalua Pork and Lau Lau… this place provides mouth-watering local Hawaiian fare at its finest! Broke da Mouth! For more information, please visit Ono Kau Kau Mixed Plate online. The former head chef at Roy’s, Joey Macadangdang left Roy’s to open up Joey’s Kitchen at the Whalers Village Food Court back in 2015. Boy, are we glad he did! Now visitors can enjoy Joey’s amazing cooking at much more affordable prices. The food is Joey’s take on Filipino-Hawaiian fusion food. It’s laid back and super casual here with counter ordering. The service is very friendly and helpful. After you order, find a seat and they will bring your food out to the table. 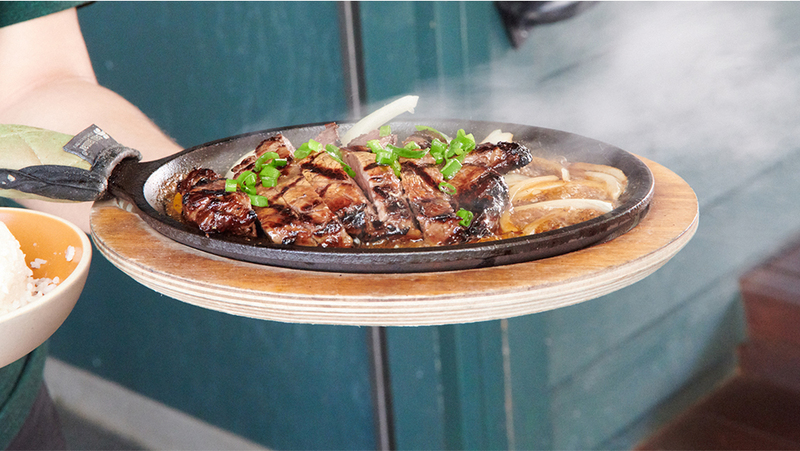 Must-have’s on the menu include the braised beef ribs. 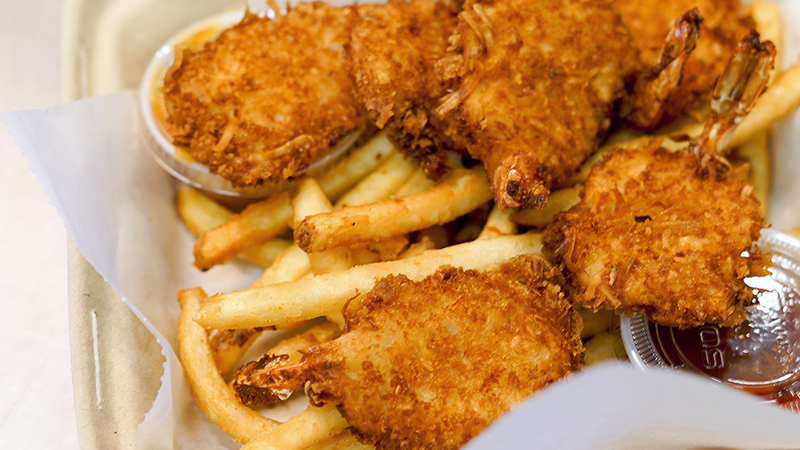 They are so tender that they literally melt in your mouth, and are served with a creamy mac salad and a scoop of rice. The coconut shrimp is also impressive served with a delicious sweet and sour aioli, and the pork adobo fried rice will keep you coming back for more. Breakfast is also awesome here! The light and fluffy banana macadamia nut pancakes are perfectly prepared and served up with a warm coconut syrup. You’ll definitely want to ask for extra syrup because it is so tasty! The perfect pair to this is the short rib hash. Wow, is it good, and served over rice with gravy and eggs cooked your way. Joey’s kitchen is a great spot to pick up some tasty comfort food local style for the whole family without breaking the bank. Open daily from 7:30 am-9:00 pm for breakfast, lunch, and dinner. For more information, please visit Joey’s Kitchen. For more information, please visit Sansei Seafood Restaurants & Sushi Bars online. The Fish Market in Honokowai is such a wonderful local food spot in West Maui! Sometimes confused as the ‘Honokowai Deli,’ the Fish Market serves local Maui fish menu items for lunch and dinner, 7 days a week. They also sell freshly caught Maui seafood and fish fillets, so it’s a great place to grab seafood for dinner or a beach BBQ. Guests can order take-out for a family beach picnic, eat inside, or dine outside under the covered lanai. Some of the most popular fresh Hawaiian fish used throughout the menu include Ono, Ahi, and Marlin. Favorite menu items are the super yummy Fish Burgers served with tomatoes, shoyu caramelized onions, and shredded lettuce on an onion roll, Fish Burritos, the Crab Cake Sandwich, Oyster Shooters, Ceviche, and the Seafood Chowder or Lobster Bisque served in a bread bowl. They also serve sushi rolls Tuesday thru Thursday and on Sundays; using Maui caught Ono, Walu, Scallops, Swordfish, Opakapaka, Onaga, Mahi Mahi, Marlin, Uku, Lobster, and more. For more information, please visit Fish Market online. 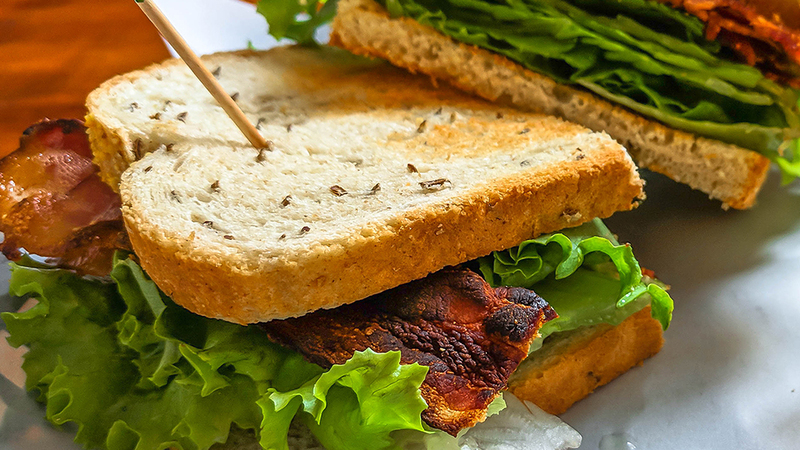 For more information, please visit Ba-Le Sandwich Shops online. No trip to Maui is complete without a visit to Leoda’s! This is a favorite home-style comfort food spot on Maui. With its warm country chic décor and delectable mini pies, Leoda’s never disappoints. 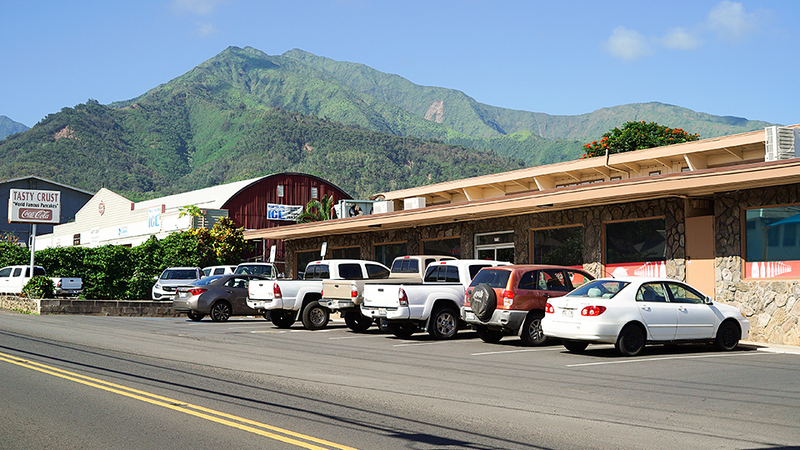 Located just near mile marker 14 at Olowalu Village, Leoda’s is a great pit stop on your way into or out of Lahaina. They offer casual counter ordering near the pie display case. Don’t worry, the line gives you plenty of time to figure out what pie to choose, or maybe just try a few and take some to go. Whichever one you decide on, you will be thinking about it for the rest of the day and wondering about the others you left untasted. Although all the pies are delicious, the banana cream and chocolate haupia are at the top of our list for must order items. They also serve up some decent salads, burgers, and sandwiches but let’s get back to the pies. Don’t forget to try one of the savory pies. We love the delicious little handheld pies stuffed with sweet Kula corn, Cotija cheese, chives, and a little lime zest. Of course, they offer the classic turkey pot pie with tons of turkey and delicious gravy with carrots, onion, and potatoes. They also do a twist on the chicken pot pie with tender pieces of chicken breast, peas, carrots, and kale. Heed our warning and beware, once you stop here, you may find yourself back for a pie before your departure from Maui. Lucky for you, they are open 7 days a week 7:00 am-8:00 pm. For more information, please visit Leoda’s Kitchen. 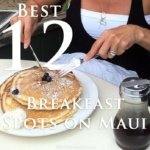 Kihei Caffe is one of the most popular breakfast places on Maui, voted “Best Breakfast” 6 years in a row by Maui No Ka Oi Magazine, Maui News Readers Poll, and the infamous MauiTime Weekly. With over 40 breakfast options to choose from, all guests will be satisfied. 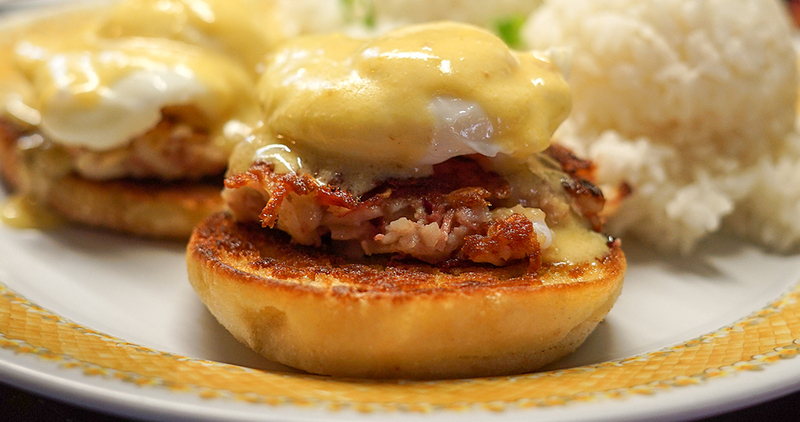 The most popular Breakfast items are the Southern Style Sausage Gravy and Biscuits (homemade biscuits), Pork Fried Rice and Scrambled Eggs, and Pancakes with a choice of buttermilk, banana macadamia nut, pineapple coconut, blueberry or chocolate chip. For more information, please visit Kihei Caffe online. When at this Maui local food restaurant, make sure to try the featured Ali’i Plate, it comes with pork laulau, kalua pork, and cabbage, lomilomi salmon, poi, macaroni salad, rice and haupia for dessert. It’s a top-a-top version of a perfectly traditional Hawaiian plate. The Coconut Prawns served with a pineapple chutney are delicious, and so is the Pohole Ferns salad, the Kalbi Beef Ribs, and the Mochiko Chicken. 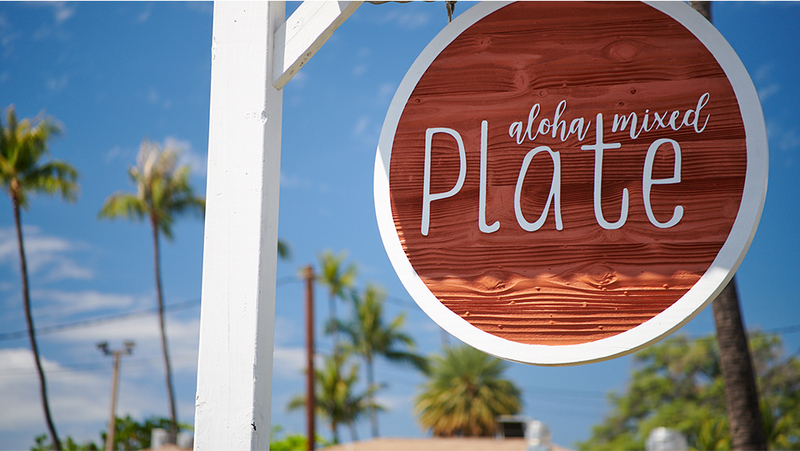 Aloha Mixed Plate has so many tantalizing local food choices on their menu, so you cannot go wrong. They also have a fabulous tropical cocktail menu…that sets them apart from other local food spots on Maui. Try the Mai Tai, Mango Lemonade, Hawaiian Angel, or the Sassy Wahine (a mango margarita with strawberries, and li hing mui powder on the rim). For more information, please visit Aloha Mixed Plate online. Da Kitchen was first established on Maui in 1998, and has since grown to two locations on Maui; presently expanding to the Island of Oahu. A really cool fact…Da Kitchen was invited to cook at the Inaugural Luau in Washington D.C. during the President Obama’s election. They’ve also been featured on numerous T.V. shows including Bizarre Food Show on the Travel Channel. Da Kitchen is definitely a hip local-style Hawaiian food restaurant, and their food is traditional, yet still creative. Must try items at Da Kitchen are the Pulehu Grilled Steak, Lumpia, Kalua Won Tons, Chicken Katsu Sandwich, and the BBQ Beef Sticks. For more information, please visit Da Kitchen online. A new addition to Maui’s north shore, Kuau Store is the last stop for food before hitting the Road to Hana. 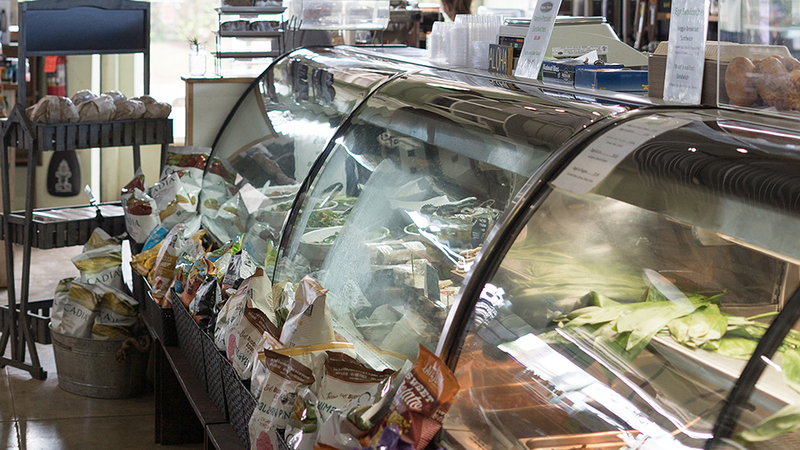 Offering a great assortment of plate lunches, sandwiches, and salad bar, Kuau Store supports Maui entrepreneurs by selling a huge selection of locally made food products, perfect for snacking on during your upcoming Hana adventure. Located one mile east of Paia Town, visit Kuau Store for morning coffee, afternoon lunch, or to-go picnic lunches, perfect for enjoying later on by a waterfall or after a surf session at nearby Ho’okipa Beach Park. For more information, please visit Kuau Store online. 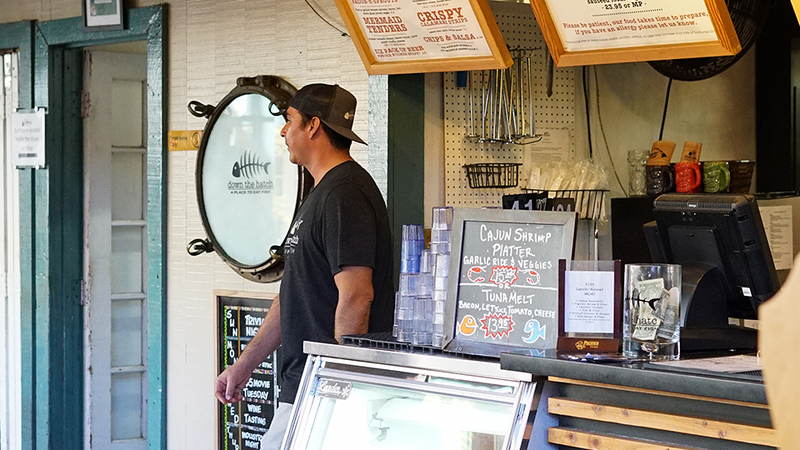 Located at the Old Lahaina Center, look for the hungry hordes of happy folks lined up outside from 8:00 am until noon. The atmosphere is kind of a small town café going Hawaiian. Open for breakfast and lunch, the menu is varied and definitely, value priced. For breakfast, they have a full page of American style egg dishes, local food choices, eggs benedicts, loco mocos, griddle cakes, and waffles. Their eggs benedicts are amazing! Daily Specials are always varied and well worth taking a look at before you order. The servers are upbeat and full of fun. 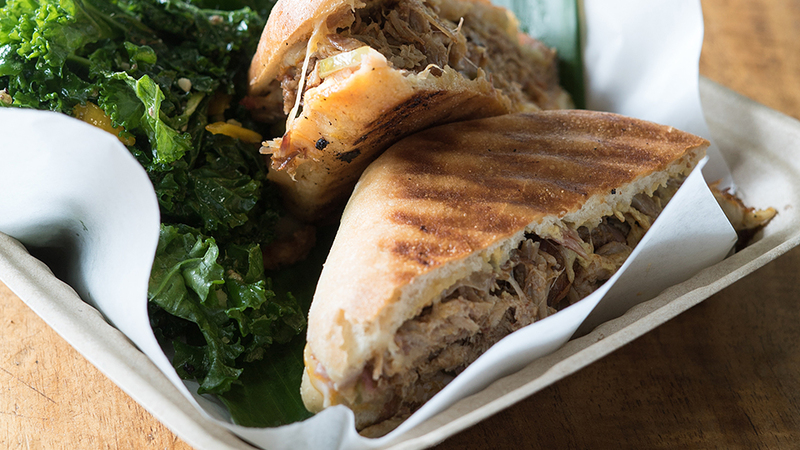 You’ll love this Maui local food spot. This newly opened Maui hidden gem is located on the bottom level of the Wharf Cinema Center across from Lahaina’s Banyan Tree. Owners Javier Barberi, David Fincher, and Julian Bonfardin came together from prestigious Maui restaurants and resorts. They definitely know their stuff! Their fish tacos, Louisiana Po’ Boys, and Lobster & Crab Stuffed Grilled Cheese Sandwiches are generating a big buzz in the Maui foodies scene. They have theme nights like Flip Coin and local Maui artist showcases, and a whole list of delicious signature cocktails. They also boast the longest Happy Hour in West Maui! This Maui hidden gem is located in an industrial area of Kihei. Kenneth and Vanessa Lee have been cooking up breakfast, lunch and early dinners seven days a week since 2006. 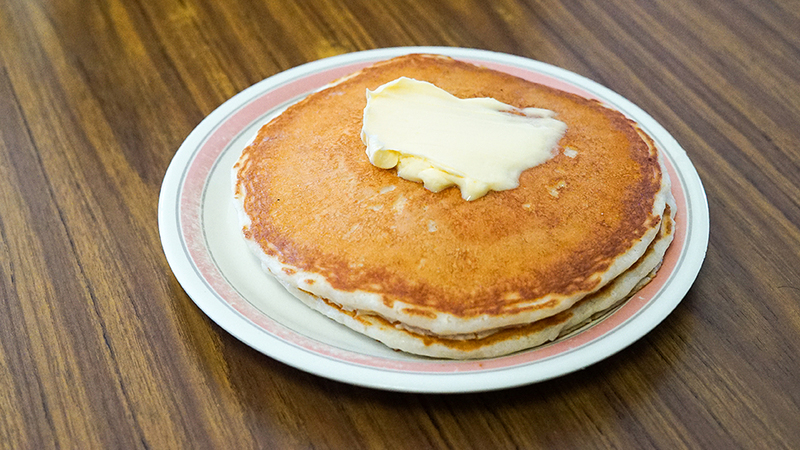 Blue Moon is best known for fluffy banana macadamia nut pancakes and a variety of American style meals. In addition, they also serve up some tasty to Hawaii local food dishes as well. After breakfast, their signature Asian/Hawaiian dishes are stir-fry vegetables with different meats and chow fun noodles. Service is pleasant, efficient and the food is value priced to satiate all budgets. Everyone love Tobi’s Shave Ice! However, don’t let the name limit you. We are here to tell you that this place goes way beyond delicious shave ice. Hand’s down, Tobi’s has one of the best “Poke Bowls” on Maui! With expertly cut tender and super fresh Ahi, how can you go wrong? They offer a variety of flavors from ginger (sweet), wasabi (spicy), and some with a mayo base. All poke bowls come with a generous portion of Ahi, your choice of brown or white rice on top of a crispy bed of romaine; topped with wonton strips and a sprinkle of furikake (dried seaweed with spices and sesame seeds). 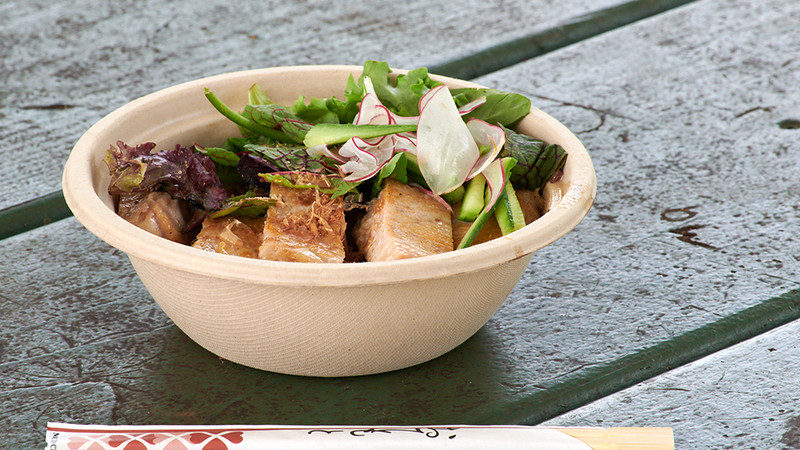 The only down fall is, these poke bowls are super popular and sell out quickly. 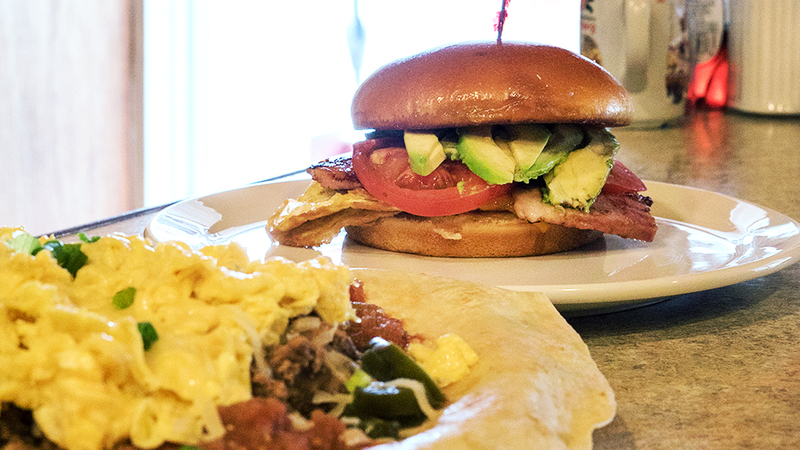 It’s a good idea to stop by for an early lunch. If you prefer cooked, they have a lime cooked Ahi ceviche with coconut milk that’s to die for. They also serve up a perfect acai bowl and some delicious plate lunch specials. The shoyu chicken is rich and moist. Don’t forget to try the shave ice with all the fixings; mochi ball in the center and a sweet condensed cream drizzle on top. 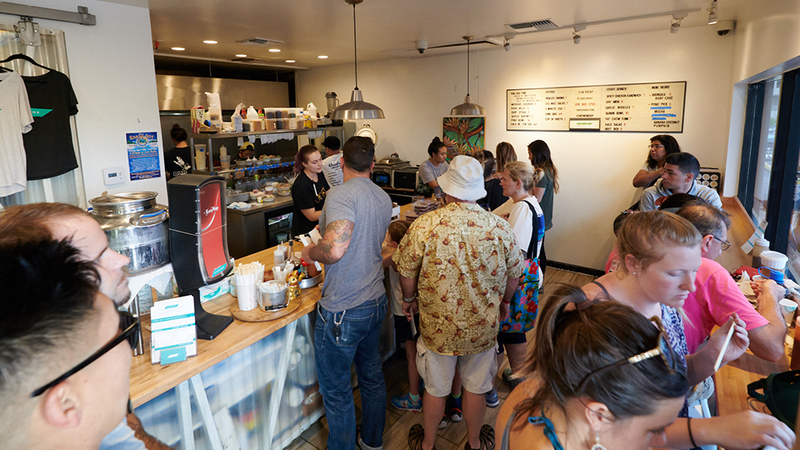 Located in the heart of Paia Town, this is a great spot to order some local grinds, sit out front at one of their tables while enjoying some ono food and great people watching. Open daily from 10:00am-6:00pm. For more information, please visit Tobi’s Shave Ice. 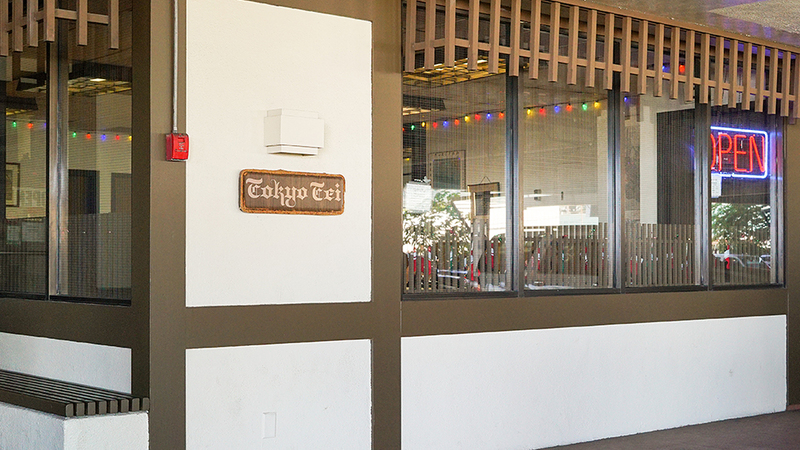 Located in Historic Wailuku Town, since 1935 Tokyo Tei has been family owned and operating for four generations. Their fast and friendly service combined with fantastic food makes this place so special. 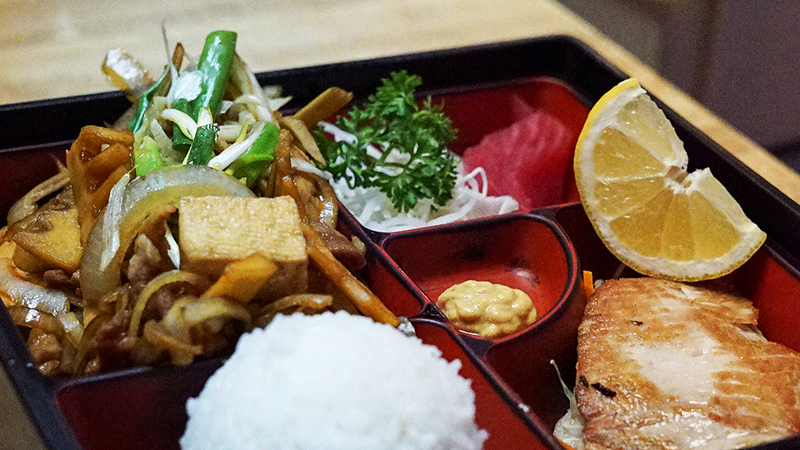 Items like the Teishoku Trays and a variety of bento and are super popular here. The Salmon Teriyaki is another favorite. The Chicken Katsu has a different feel and texture than most versions of this classic Hawaiian dish, so you definitely should try it! The quality is quite impressive, and they have super reasonable prices for a traditional Japanese mom and pop style restaurant. If you are looking to try Japanese food done Hawaiian-style, definitely go to Tokyo Tei. Owners of Bailey’s Café Food Truck, Selena and Durien Bailey, take the classic plate lunch to new heights. They serve up locally sourced, organic ingredients prepared into familiar “plate lunch” dishes with a twist. 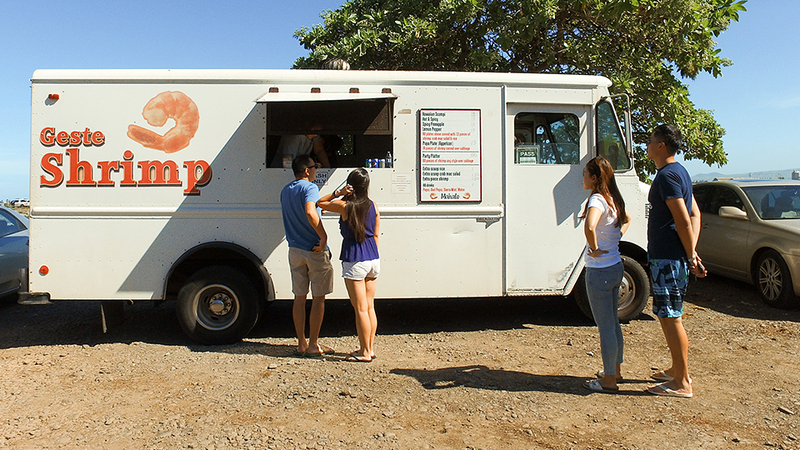 Bailey’s Café is a food truck at the Haiku Marketplace on Maui’s North Shore. You will enjoy the relaxed and inviting atmosphere here, so laid back. Yet, the service is personable and very helpful. After you order just sit back and enjoy a table in the shade. 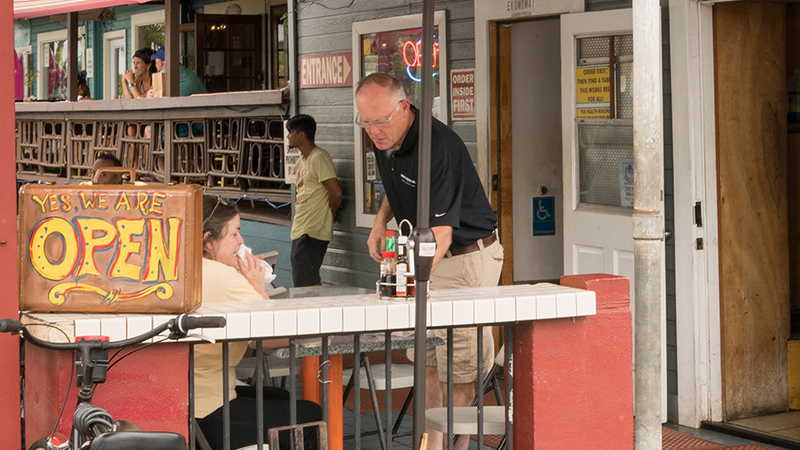 Bailey’s Cafe is very popular with locals in the area, and with the word out, getting more and more popular by the day. We can’t say enough about the food. Our favorites list starts with the chopped steak plate. 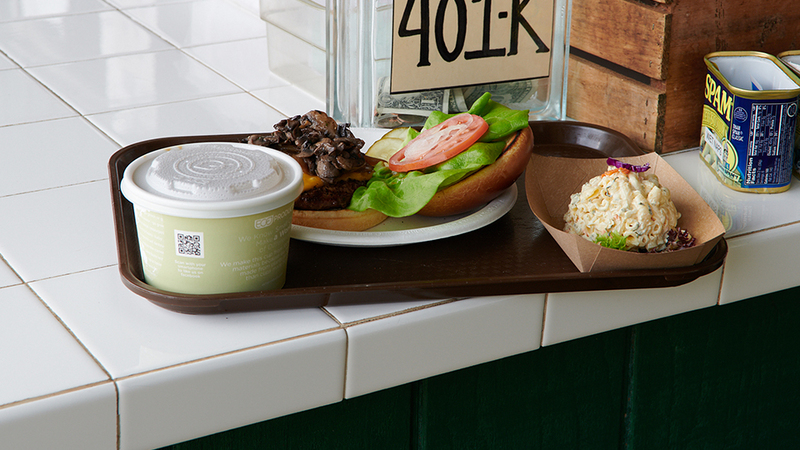 The steak is 100% grass-fed beef born and grazed in Hawaii. It’s also prepared to perfection, juicy and tender with just the right crispiness around the edges. Cooked in rosemary and balsamic, it’s age perfect balance of flavors. We also loved the fried rice and shoyu chicken. Pair any of these dishes with fresh turmeric ginger lemonade or a fresh smoothie made with local fruits and you’ll be in heaven. 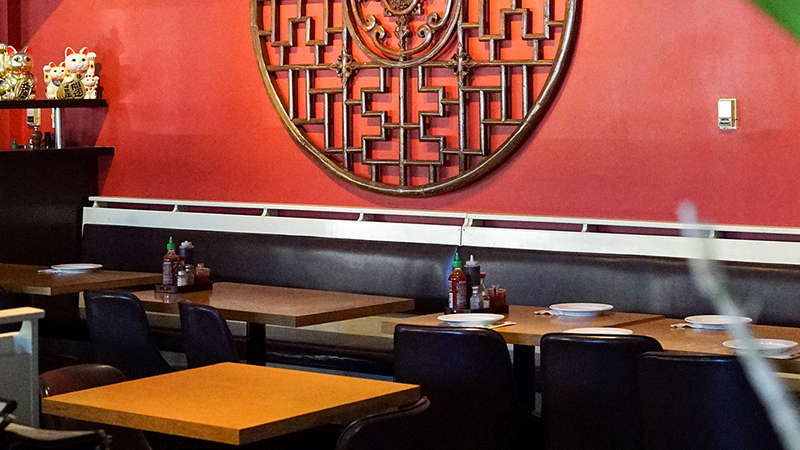 They also offer some delicious vegetarian and vegan options that include a tasty pan-fried tofu plate lunch. All plate lunches come in two sizes half and full order, accompanied with house made mac salad and fresh local greens salad. Everything prepared at Bailey’s Café is so fresh and yummy, everyone will full, happy and dreaming of their next visit. Open Monday through Friday from11am-7pm. For more information, please visit Bailey’s Café Food Truck. Poi By The Pound is located in the Kahului Industrial area. 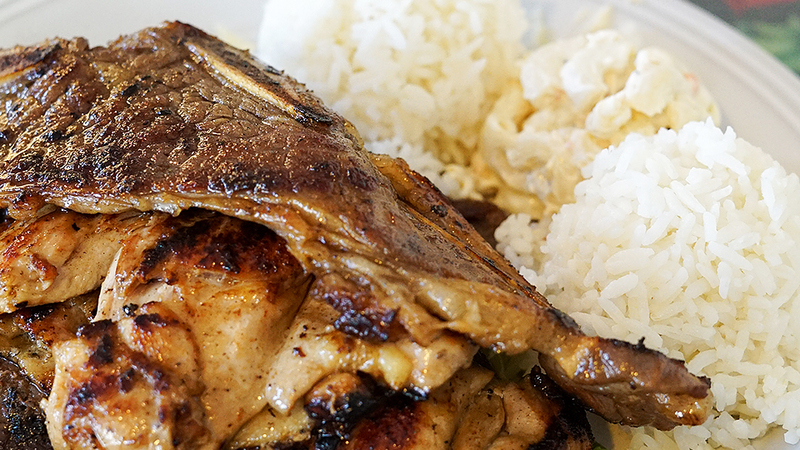 They serve authentic Hawaiian-style food like Kalua pork, Lau Lau, Chicken Long Rice, plate lunches, and poi, of course! The ambiance is super casual, Hawaii plate lunch-style, and all of the staff are friendly, accommodating and full of aloha. Take out, or dine-in to experience island style food without the tourist frills and high prices. been cooking up the best BBQ dishes on Maui since 1999. 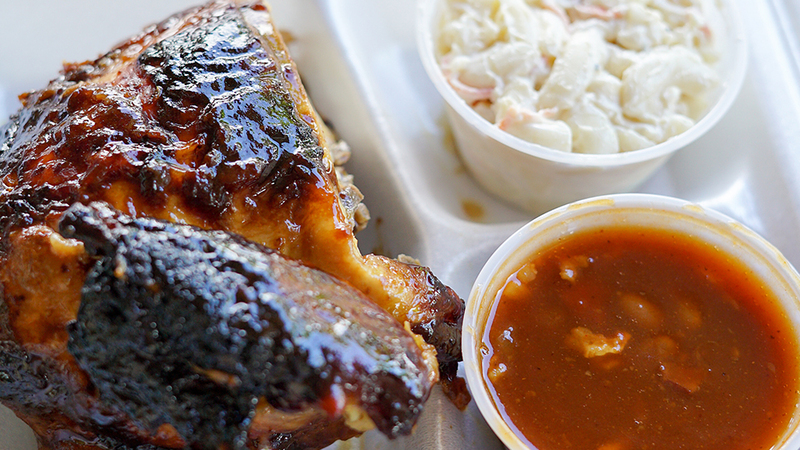 If you love fall-off-the-bone baby back ribs, moist and tender juicy rotisserie chicken, tasty Portuguese bean soup, hearty chili, wraps, a variety of salads and yummy desserts, you’ll adore this Maui local spot. The food will remind you of Sundays at your grandmother’s house. 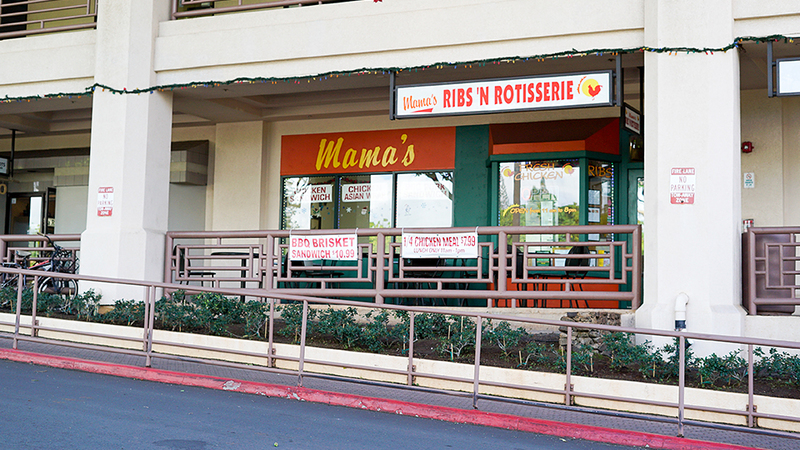 Mama’s is a great alternative to high prices and fast food for both locals and island visitors. Owners Tootsie and Chef Bonny are famous for making one of the most delicious local-style burgers on Maui. 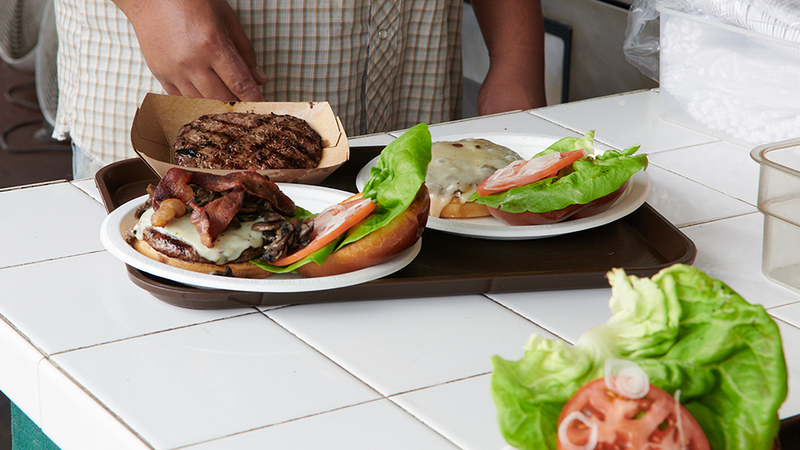 All of their burgers are handcrafted from local Maui Cattle grass-fed beef. Although the menu offers a variety, it’s the Original Korean Burger that is so mouthwateringly unique. It’s dressed with a homemade kimchee and the most amazing secret sauce that they call ‘kochu jang aioli.’ You’ll find all of this piled up on a perfectly buttery and toasted brioche bun. Last, it’s also drizzled with a kalbi style glaze. 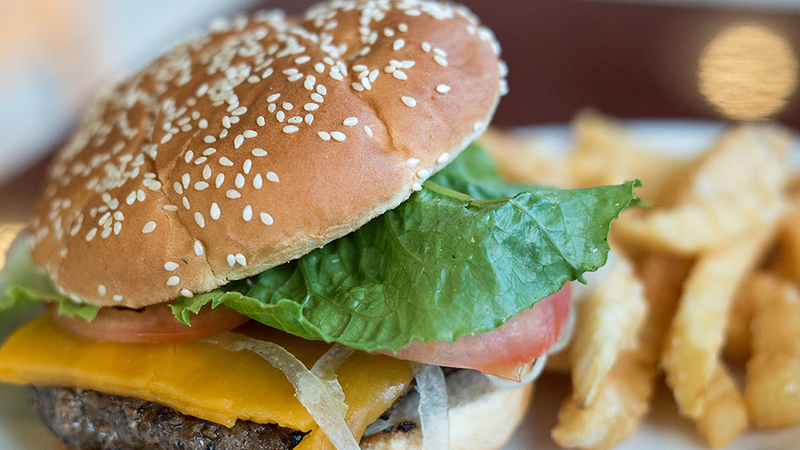 Believe us, you will find yourself craving this burger long after you have eaten it. If you prefer to skip the bun, order the burger in a bowl. 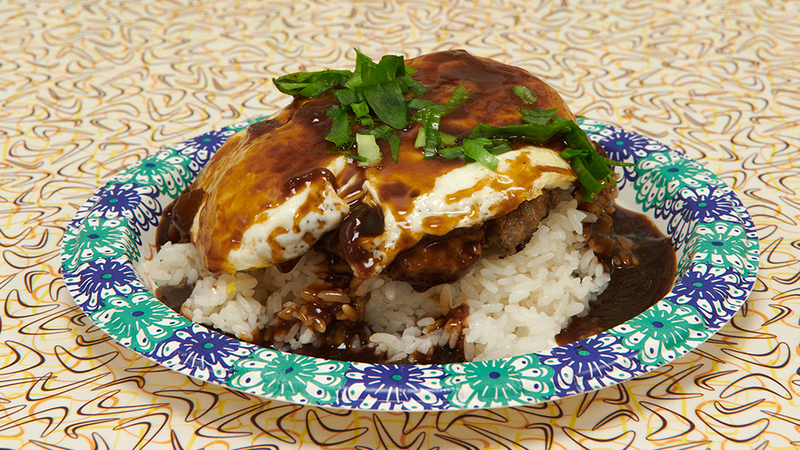 This is a delicious alternative, and it’s served over white rice and smothered with a Maui onion house gravy. If burgers aren’t your thing, they also offer their signature jumbo all-beef hot dogs; served up island style on a toasted sesame roll. For sure, these local chicks know how to serve us some distinctive toppings! Refreshing cucumber and tomato relish, homemade kimchee, wasabi aioli, and roasted garlic aioli are just of few of the tasty extras here. 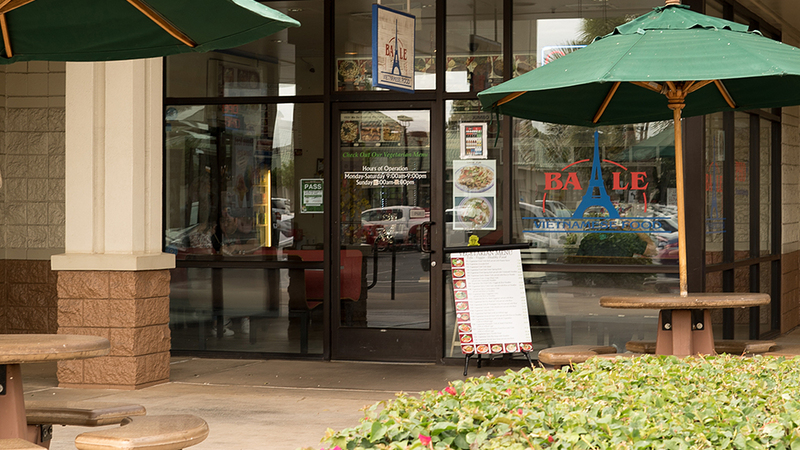 They also have an amazing selection of healthy salads made with locally sourced Kula greens and Maui tomatoes. The fresh, locally caught and seared Ahi Steak Salad is also a must try! 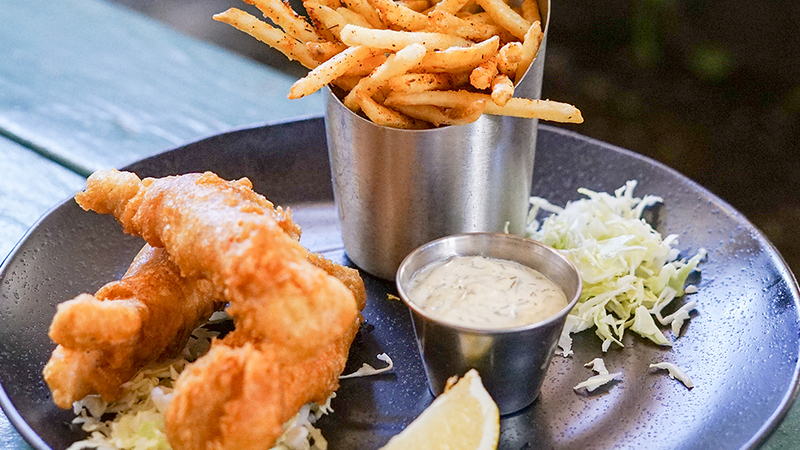 By the way, everything on the menu goes perfectly with a side of their famous hand-cut fries! Order them served up simple with sea salt and house seasoning, or go big with the gravy fries. They’re topped off with a house made Maui Onion gravy and shredded mozzarella cheese. P.S. You definitely can’t go wrong with a visit to Upcountry Maui to Fatt Chicks’ new food truck location. It’s right next to Long’s in Pukalani. Tootsie and Chef Bonny take pride in serving up fresh locally sourced food that is so good, you can taste the aloha in every bite. For more information, please visit Fatt Chicks. 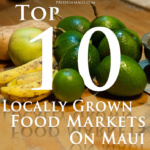 Mahalo for reading our list of the best places for local food on Maui!